Here we are with more Legendary Collection Kaiba cards to review this week, starting off with one of the promos, Goddess of Sweet Revenge. GoSR is a Level 6 Light Fairy with 1800 ATK and 2000 DEF. Type is solid and attribute is great. Level 6 is fine, but 1800 ATK and 2000 DEF leaves more to be desired for the level. GoSR will only trigger in the hand when you are in the worst condition possible, so I assume you won’t be summoning this. 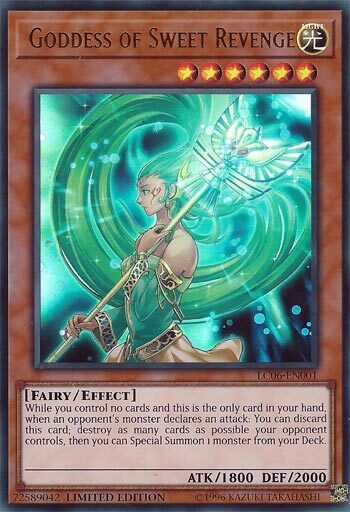 If this card is the only card in your hand, you control no cards on the field, and your opponent declares a direct attack, you can then ditch this card to destroy every card your opponent controls as possible and then summon any monster of your choosing from the deck, as long as there is no condition stopping you from that monster. I mean, it is a great card for coming back, but how often will you be in the position where you have no cards on the field and this is the only card in the hand. Sure, you can use Fairy Tail – Snow to help get this condition off, but would the cards you already have be worth is it what you have to ask. If you pull this off somehow, you might be able to get a comeback win, but the condition is very rare and hurts this card. Art: 4.75/5 Very beautiful art at least. Goddess of Sweet Revenge opens the week. This is a very interesting Hand Trap card, as it does a lot more than the average one does. Ignoring the Hand Trap part for a moment, this card isn’t great. 1800 attack on a Tribute Monster (no Tuner, I mean, nothing going for it really…although Light and Fairy are good). I referenced Ex Minion of Darkness once in a review last week, and I’m going to again here today…normally, a card that FORCES you into a situation where it has to be the only card in your Hand, and the only one you control period, would be terrible, unless somehow it resulted in you winning the game by using. You could get close with this though. When your opponent declares an attack (assuming the aforementioned criteria was met) you can discard this card to the Graveyard. You then destroy as many cards your opponent controls as possible, and then you get to Special Summon a Monster (ANY Monster) from your Deck. In a base sense, assuming this all goes through, and you get to the Special Summon part, you’re at 1-for-1…this card given up, and a new Monster on your Field. Being a Hand Trap makes this difficult (or more so than just a Trap/Magic/Monster Effect) to counter or prepare for. But the biggest downside I have isn’t even how this has to be all you have to use, but you’re still left with nothing even if you’re successful to the end…it’s certainly possible you could Draw, or Special Summon, or both (what have you) off of whatever Monster you gain via this card, but if you aren’t winning very soon after, it’s a lot of work to go through, especially if it leads to you losing. Believe it or not, I was trying NOT to sound to much like EMoD here, I kinda went both ways. Rating: 4/5 It could turn the tide of a duel, and it’s certainly possible to plus off. Not quite per say in the way maybe a Cyber/Fiber Jar could, but it could wreck open a game.